FORT BRAGG, NC, August 13, 2015, Diane D. Scherr, Officer in Charge of the Outpatient Clinic at Robinson Health Clinic on Fort Bragg, has been recognized by Elite American Nurses for dedication, achievements, and leadership in nursing administration. For more than 30 years Ms. Scherr has been fostering nursing and administrative skills that currently enable her to fulfill her responsibilities at the clinic. In her current capacity, Ms. Scherr serves as the overall manager, administrator, and leader of the largest Army Primary Care Clinic, with an enrollment of over 40,000 soldiers, retirees, and family members and a payroll of over 150 military and civilian personnel. She is responsible for oversight of all staff actions, budget expenditures, clinical operations and continued implementation of Patient Centered Medical Home Model. Previously, while Chief Nurse with the 28th Combat Support Hospital for three years, Ms. Scherr ensured all clinical operations of the hospital were in place, which included all medical personnel were licensed, certified, trained and competent in their patient care duties for worldwide deployment. Ms. Scherr was accredited as an RN through the Southern Connecticut State University at New Haven. She also earned as Bachelor of Science in Nursing, and a Master of Science in Nursing with a Concentration in Family Nurse Practitioner studies from the University of Massachusetts. In addition, Ms. Scherr received a Master’s Degree in Nursing Education from Duke University. She is a member of the Virginia Nurses Association, the American Academy of Ambulatory Care Nursing, and Sigma Theta Tau International. 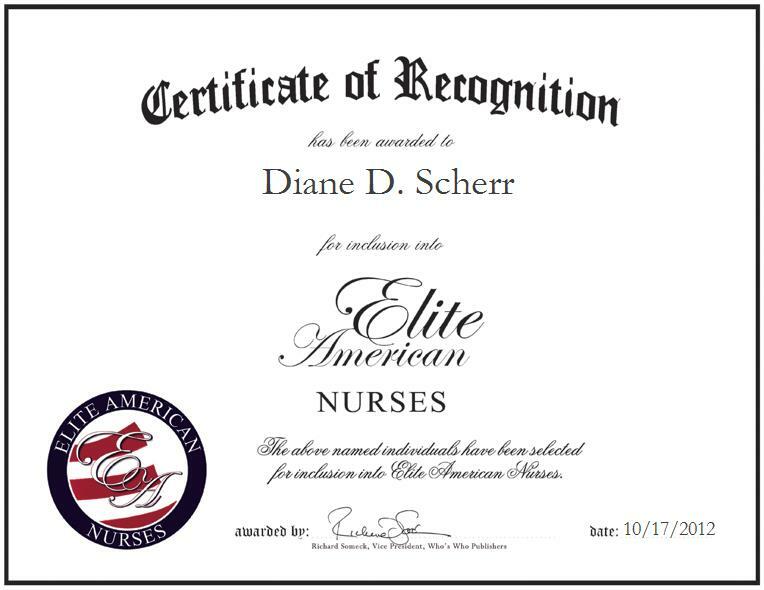 Diane Scherr was originally selected for inclusion in EliteAMERICAN Nurses in October 2012. We are proud to be featuring Ms. Scherr again in EliteAMERICAN Nurses for 2015. This entry was posted in Military Nursing and tagged Army, family nurse practitioner, nursing administration, registered nurse, U.S. Army Nurse Corps. Bookmark the permalink.